Our cotton kitchen apron is fashion and comfortable. It is a beautiful cooking uniform in your kitchen. We have different styles and various color for your choice. About the packaging, we can supply polybag or headcard or paper taps. Logo on the bag is acceptable. The MOQ of the cotton kitchen apron is 2000 pieces per design. We will make new mould as your artwork. Printing Methods: silk printing, heat transfer or other requird printing methods. We are one-stop manufacturer and can make customer's ideas into sample within 7days. Customer's artworks and designs are welcome. The packaging can be as customer's artwork. Logo on the bag is acceptable. 1) OEM service available and custom designs are very welcomed! 2) Available in different materials and assorted colors. 3) We can offer you premium quality, competitive prices, prompt delivery and low minimum orders. 4) We can manufacture all kinds of bags according to your design and sample, we are more than happy to answer even the smallest question for you and we will gladly give you a bid on any item you are interested in. A: We are a factory with more than 10 years experiences in this business line. A: We are honored to offer you samples if your courier account could be provided to us. 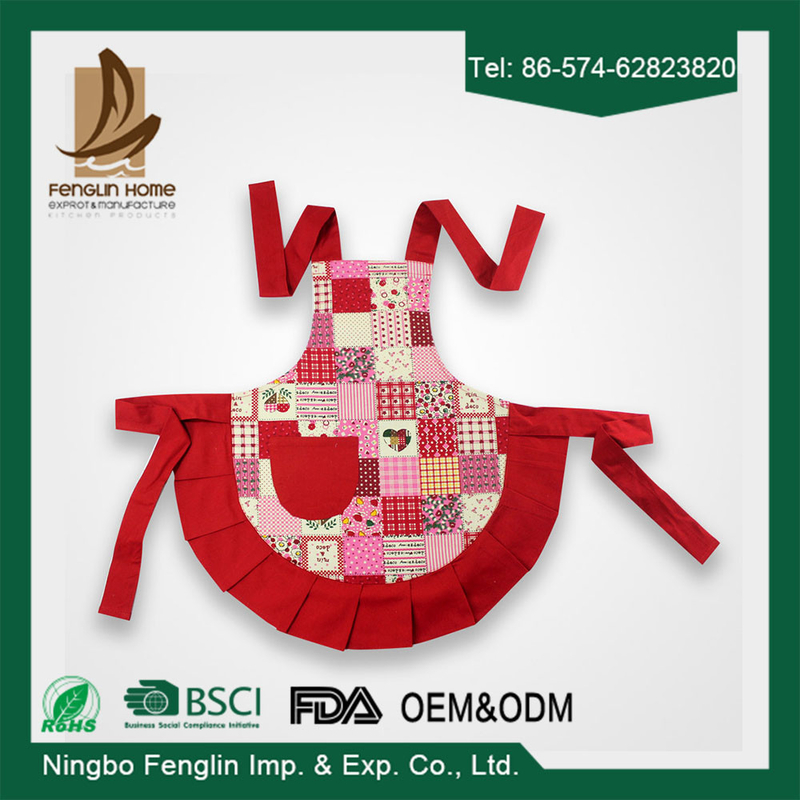 Ningbo Fenglin is a manufacturing and trading company in China. The factory is specialized in home textiles, such as cotton kitchen apron, oven mitt, kitchen towel and so on. We have professional workers to produce home textile items. There are approx.100 people in the factory. We have sewing room, cutting room, printing room and packing room. Our own printing room can do hand-made silk screen printing method.